In honor of St. Patrick’s Day, we are reprinting a post about a rather anti-Irish book from the blog of Jim Naughton ‘15, who was a JLPP intern in the summer of 2014. Jim is now enrolled in Loyola’s Law School. Another great book has surfaced in Loyola’s University Archives and Special Collections that raises some interesting questions about authorship, provenance, and readership. The book, Ancient Irish Histories, includes the work of four separate authors complied and edited by Sir James Ware. Front cover of the 1809 reprint of the 1633 first edition of Sir James Ware’s Ancient Irish Histories. So who was Sir James Ware and why did he decide to take the time to compile and edit this set of Irish histories? 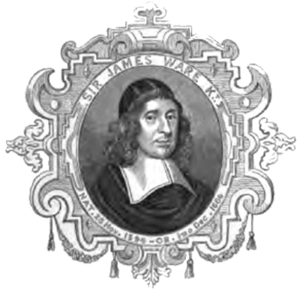 Ware was born in 1594 in Dublin to a British administrator (also named James Ware) who served as a Secretary to the Lord Deputy of Ireland and later as an MP (Member of Parliament). Due to his father’s high position in government, Ware attended Trinity College studying Latin and Greek as well as gaining an interest in Irish history. After college, Ware began a political career but still tried to publish scholarly tracts, a process that was interrupted by violent conflicts that erupted in Ireland and Britain. This conflict was known as the War of Three Kingdoms. (In the Irish theatre of the war, it was more commonly known as the Eleven Years’ War.) For more detailed information on the War of Three Kingdoms you can visit the BBC who published a concise and interesting article on the War. So what side did Ware fall on during this conflict? He supported James Butler, the 1st Duke of Ormond, who fought for the British monarchy against the various other factions in Ireland. For a fuller account of Ware’s life and his activities during the War of Three Kingdoms follow this link. We now know that Ware supported a Duke, who in turn supported the British government against the Irish. Now we have to ask ourselves: what were the other authors attitudes towards Ireland? Did Ware’s stance bias his version of Ireland’s history? 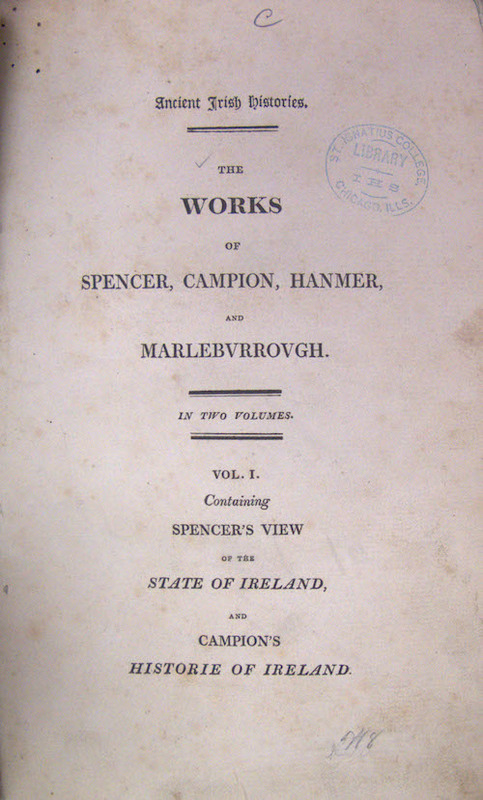 Meredith Hanmer and Henry of Marlborough are both included in Ware’s Ancient Irish Histories but their views are not as clear as Spenser’s and Campion’s. However, it is obvious that Ware’s history has a fair amount of British bias and an interesting story behind why Ware would pick these particular authors of Irish history. Inscription on the flyleaf of Loyola’s copy of Ware’s Ancient Irish Histories. It looks like an address, but where? Finally, who would have been interested in this title when it was brought to Loyola? This book could have been used in a history class centering around Ireland, but do you think the professors at Loyola would have used a book that has this sort of bias? Perhaps this book was used and some of the inflammatory remarks found in its pages were meant to spark discussion? What do you think this book was used for and who do you think would have checked this book out? Want to read a copy of Ware’s book for yourself? There is a copy available on Hathitrust for free. Click here. 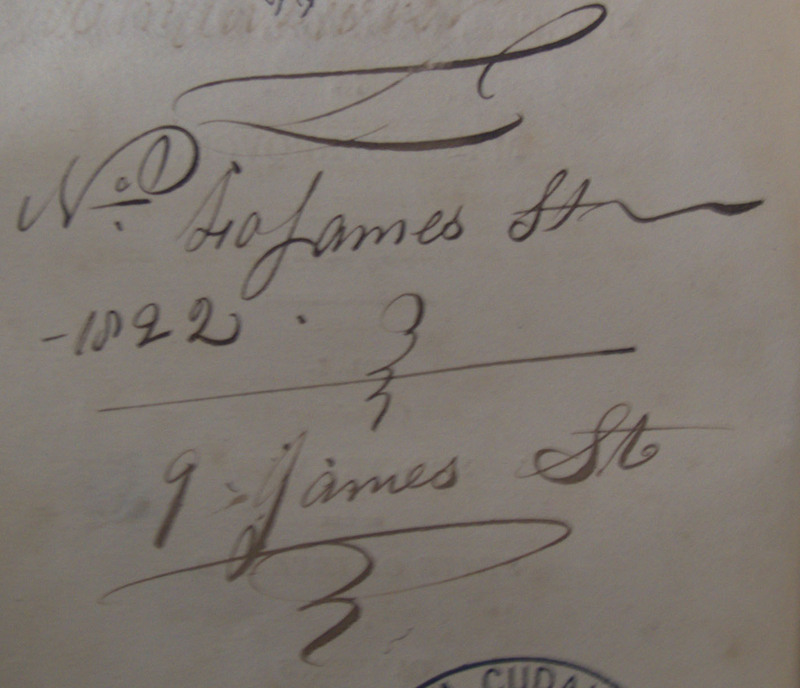 ← Did the Jesuits intend to found a law school in 1870?